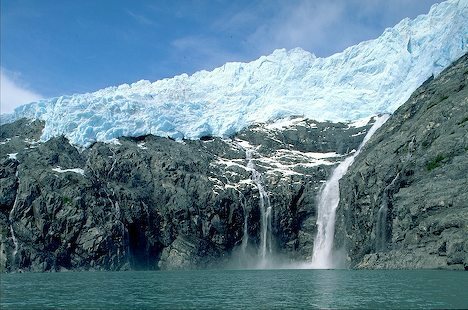 According to a new paper out by James Hansen, human warming could force glaciers to melt so fast that seas rise by as much as ten feet in as few as fifty years. Ten feet in fifty years of business as usual fossil fuel burning. It’s enough to change the face of human civilization. To render many of our vast cities waterlogged wastelands as a tide of migrants flood inland to flee the all-too-real rise of the waters. It’s a situation we really need to get a handle on. One we should be monitoring with increasing concern. One we should absolutely be trying to prevent by ramping down fossil fuel burning as swiftly as possible. 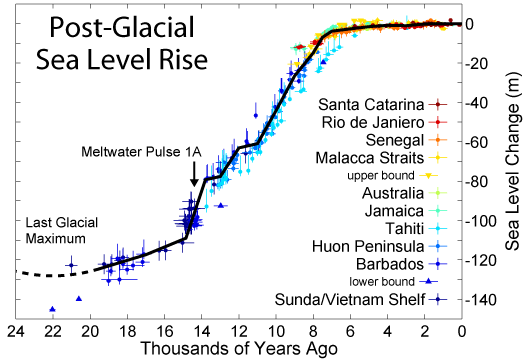 Over the past Century, global sea level rise has been following a steadily sloping curve. 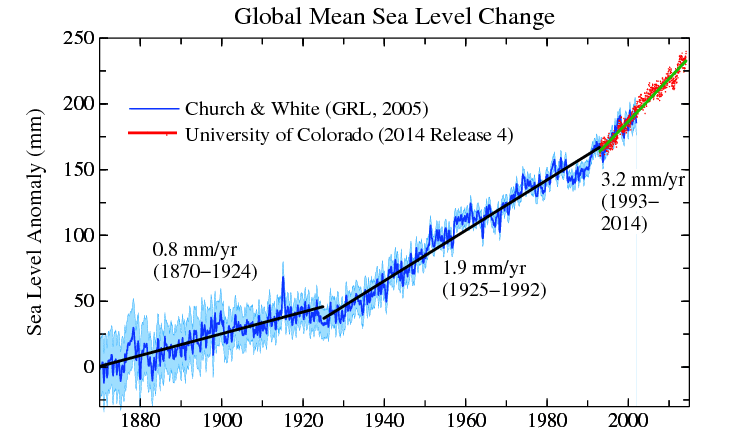 At the beginning of the 20th Century, rates of global sea level rise were a mere 0.8 millimeters each year. By mid Century, the rate had increased to around 1.9 millimeters. And by the first decade of the 21st Century, the rate had again jumped — hitting 3.3 millimeters. As of 2014, satellites above the Earth had sniffed out another jump in the rate of sea level increase. A surge in the pace of rising water spiking well above the 3.3 millimeter per year trend line. A potential warning sign that basal melt of ice sheets in Antarctica and Greenland was starting to have an ever-greater impact. For as of this past month sea levels had spiked to nearly one centimeter above the annual trend line. A record spike that, as yet, shows little sign of abating. Other than glacial melt and thermal expansion of the oceans due to a continued accumulation of heat, there are a few other ocean and atmospheric features with the potential to wag the overall trend line. 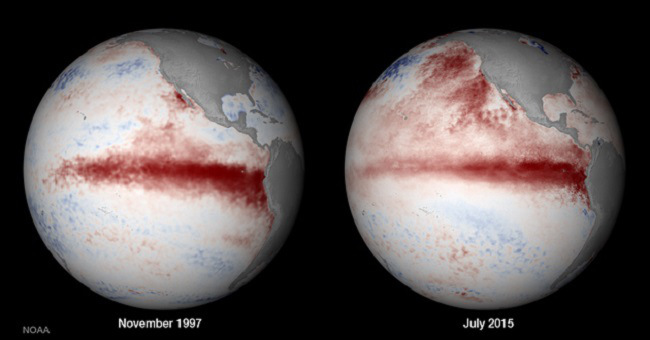 One of these is El Nino. And this year is likely to feature one of the strongest El Ninos on record. But the current spike is also the highest upward variance we’ve seen in the entire satellite record dating back to 1993. It’s a severe wag to the upside that’s worth at least a couple of raised eyebrows. To hit Hansen’s 10 foot in fifty year mark, what we’d end up seeing is a doubling in the rate of glacial melt from Greenland and West Antarctica every 5-10 years. It’s an extraordinary pace of melting. A signal that should show up in the GRACE satellite sensors measuring gravity loss from the great ice sheets. This signal, however, would also start to show up in the global sea level rise monitors as a continued ramping up of the pace at which oceans are surging. And we can’t entirely rule out that we’re observing some of that quickening in the spike we see now. It’s becoming all too clear that we’re rolling with some seriously loaded climate dice. California, suffering through its second year of a desiccating 1,000 year drought, is now facing down a new set of related tragedies. Over the past few days temperatures rocketed into record triple digit heat. The Golden State, turning more and more into the withered Brown State, faced hot Santa Anna winds and a new eruption of dangerous fires. According to news reports, 14 major fires are now absorbing the efforts of an army of 7,000 firefighters and California National Guard members. In total, more than 1,000 people have been displaced by the fires raging throughout Northern and Central California. Ten structures, including homes, along with boats and vehicles, have been destroyed even as more than 300 are now threatened. Of the most intense and dangerous fires, the largest fire covered 13 square miles in Lake County. That single blaze alone forced 650 residents to evacuate and destroyed two homes. As of late Thursday night, this dangerous fire was only 5 percent contained. Nearby, Brenna Island saw a brush fire tear through a mobile home park destroying six structures along with numerous boats and vehicles. In Nappa Valley, a 12 square mile inferno spread beyond containment lines to threaten 136 structures — forcing another 200 people to evacuate. Over on the shores of Bass Lake a fourth fire nearly doubled in side — surging from 3 square miles to five square miles in just one 24 hour period. As the Bass Lake fire encroached upon the Cascadel Woods community another 400 persons residing in approximately 200 homes were forced to flee. By early this morning, the rapidly expanding fire was only 30 percent contained. 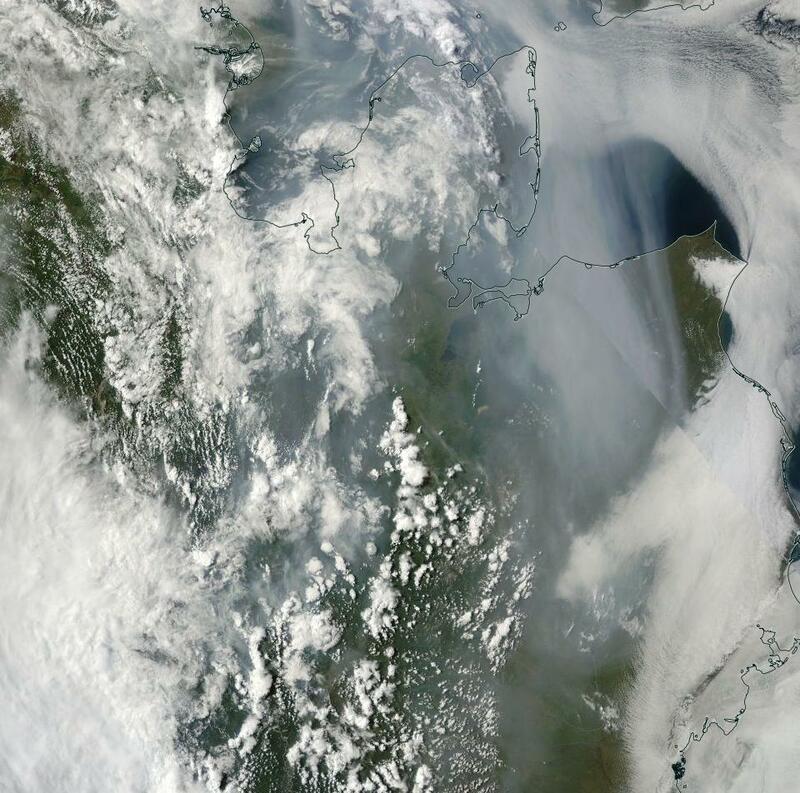 By yesterday afternoon, smoke from these wildfires was beginning to show up in the NASA/MODIS satellite shot. A dark pallor and haze that is all-too-likely to expand over coming days as temperatures in the middle 90s to lower 100s (Fahrenheit — 35 to 41 Celsius in the metric conversion) are expected to remain in place through next week. Off-shore, a massive pool of hot water continues to worsen California’s misery. The hot pool, also called The Blob, has maintained sea surface temperatures in the range of 3-5 degrees Celsius above average for the better part of two years now. These record hot Northeastern Pacific Sea surface temperatures, in turn, aided in the development of a persistent high pressure ridge. To the north, a recession of sea ice in the Arctic Ocean has aided the ridge — allowing the Jet Stream to surge northward over Alaska, Canada and, at times, into the High Arctic itself. The result is a kind of hyper-ridge feature. An obnoxiously long-lasting and vast spike of hot, dry air driving deep into the polar zone itself (hear more about the ridge and other climate change related extreme weather features in a recent radio chat I had with Hal Ginsberg). 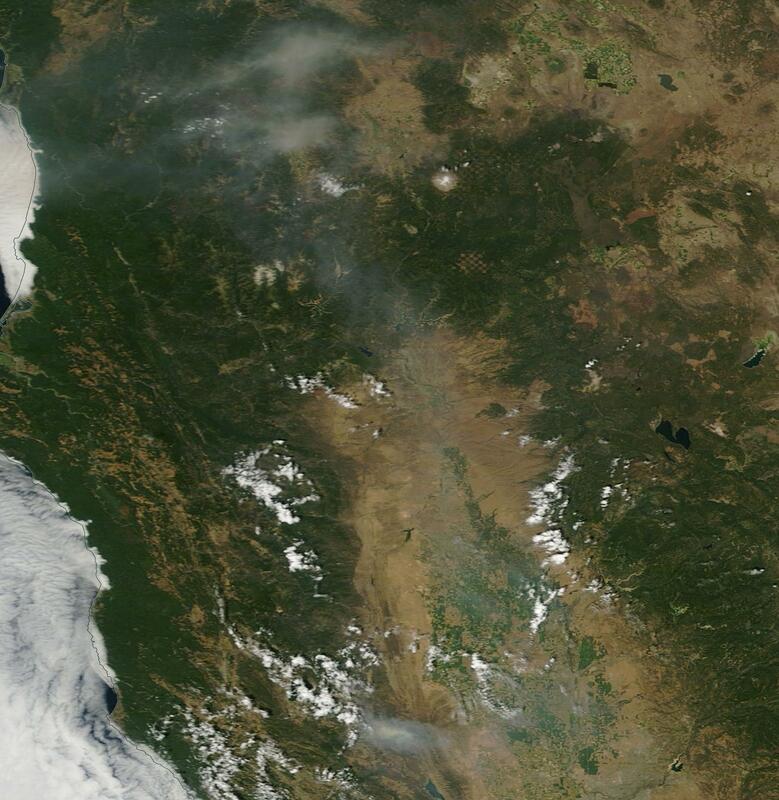 For over two years, this ridge has warded off rainfall-granting storms all while baking California and the U.S. West Coast under month-after-month of record heat. The result is that fully 59 million people across the US West alone now suffer from drought. But the epicenter of this historic and unprecedented event is California. There, 97.5 percent of the state is still sweltering under drought conditions with a huge swath through the central portion continuing to experience the most extreme conditions we have a measure for. 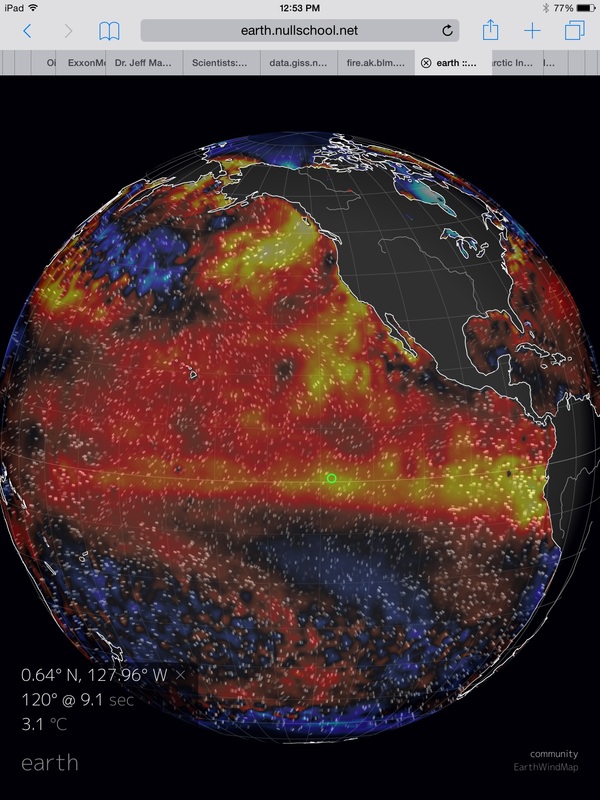 Can a Powerful El Nino Beat Down the Ridiculously Resilient Ridge? 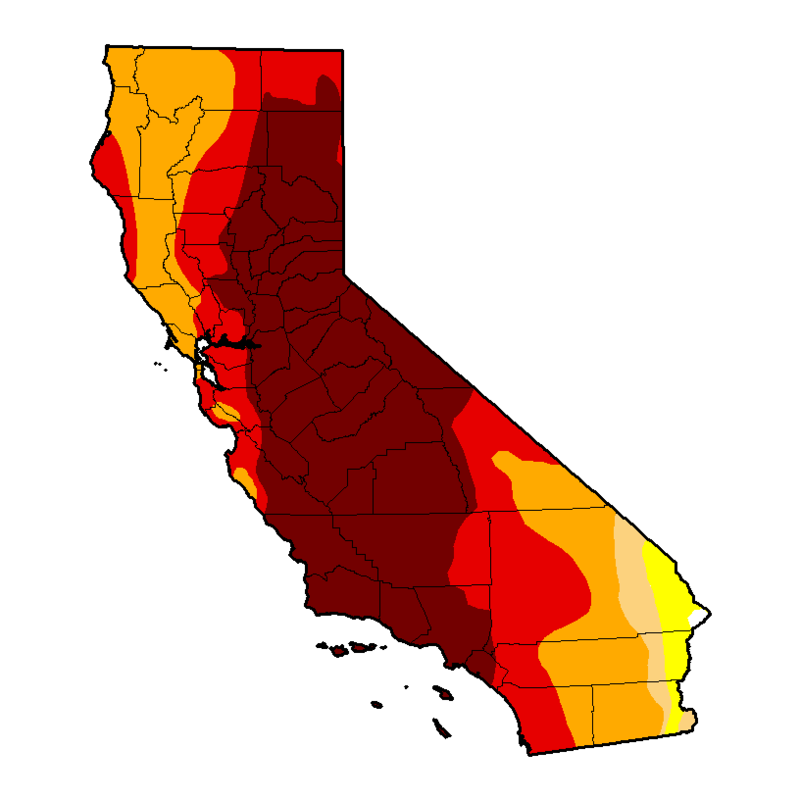 The California drought is now so intense that the state has lagged one year behind in rainfall. In other words, for the drought to end, nearly two feet of rain would need to fall over every inch of this parched and burning state. Earlier this month, an anomalous monsoonal pattern dumped an inch of rain over sections of San Diego. But this odd storm only effected the extreme south while the rest of California continued to dry out. And so the epic drought continues with no real hope for relief until Fall. Then, an El Nino, which is likely to be one of the top 3 strongest ever seen, may begin to send a series of powerful storms marching toward the US West Coast. But for that to happen the warm water zone off the California coast must fade, its associated high pressure systems must fail, and the Jet Stream which has tended to dive north into the Arctic, must flatten. That’s what we pin our hopes on now for California rains — an El Nino strong enough to smash the Ridiculously Resilient Ridge and to, for a short time, alleviate some of the more brutal impacts of human forced climate change. A respite that may not come at all. Or, perhaps just as bad, when it does come — dump that 2 feet of rain all at once. 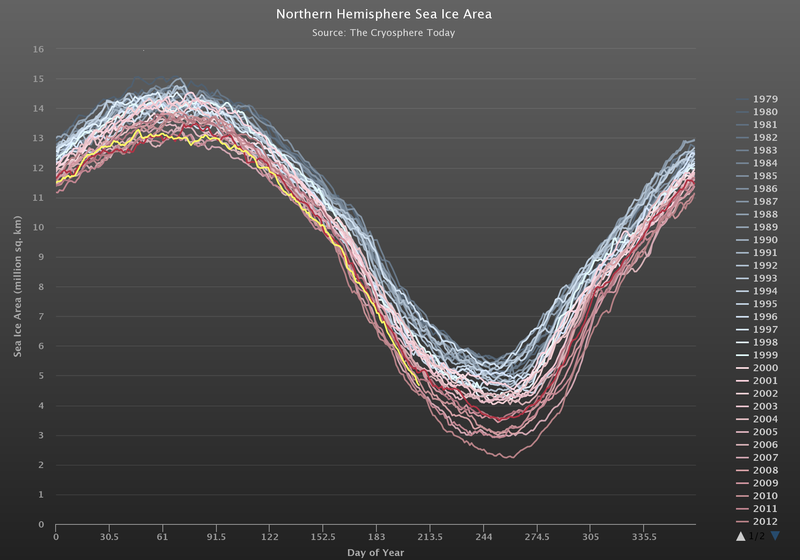 When looking at Arctic sea ice melt, there are trends and there are bounces. The great 1979 to 2015 melt we call a trend. The 2013 and 2014 rebound from all-time record lows during 2012? That we call a bounce. But it’s starting to look more and more like the bounce is ending and the long-term melt trend is starting to, inexorably, reassert. …something more important for the longer term could be happening. If this weather keeps up – and according to the current forecasts, it will for at least another week – that thicker multi-year ice could receive such a beating that the slight rebound from record low levels is essentially wiped out by the time winter sets in again (see also an excellent related article by Dana Nucitelli here). Overall, it was a decent rebound. By September, minimum seasonal ice popped up by about 3,500 cubic kilometers in the PIOMAS volume record, by about 1.4 million square kilometers in the Cryosphere Today area measure, and by 1.5 million square kilometers in the NSIDC extent measure. A decent rebound, but still about 11,000 cubic kilometers lower in volume than 1979 (more than a 55 percent loss), about 1.9 million square kilometers lower than 1979 in area (more than a 36 percent loss), and about 1.9 million square kilometers lower than 1979 in extent (about a 30 percent loss). Sadly, a bump of this kind does not a trend make. 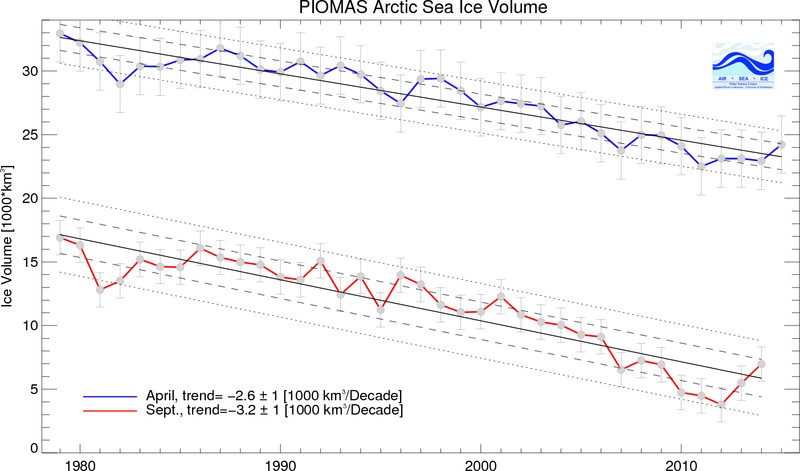 Looking at the overall volume loss line (above), we can clearly see that the 2013 and 2014 rebound after 2012’s record low was plainly within the melt progression’s boundaries. Moreover, out of the last 8 years, 2014 is the only year above base-line rate of loss at 3,200 cubic kilometers per decade. A rate of loss that, if it continues would bring us within striking distance of a dreaded ‘blue ocean’ type event for the Arctic by the early 2020s. 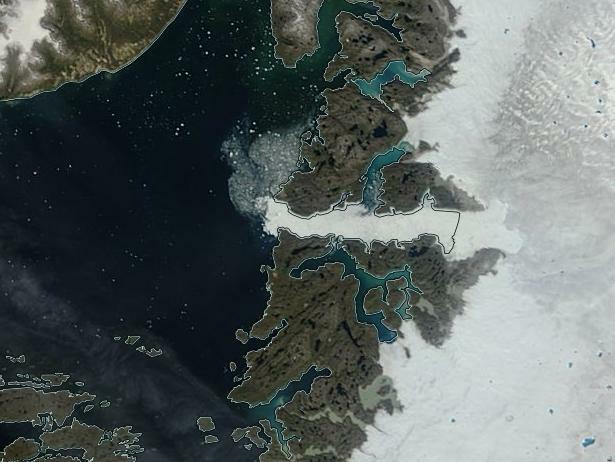 Since this trend is polar amplification driven — an underlying aspect of phase 1 climate change forced by human greenhouse gas emissions — the only major driver with the potential to challenge Arctic melt is a large outflow of fresh water from Greenland. Such an outflow would temporarily reduce ocean ventilation of heat through the sea surface in the fresh water outflow region. The result being that surface temperatures would, for a short time, cool in the outflow zone. This would have an effect of regenerating sea ice in a larger counter-melt-trend feedback. 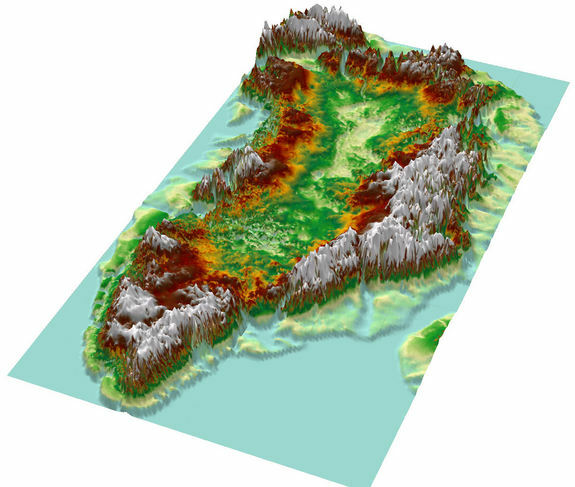 It’s likely that melt outflows from Greenland would need to be significant enough to have profound impacts on the Arctic environment as a whole. To hit anywhere near these levels, we likely need to see in the range of at least a half centimeter of sea level rise from Greenland melt alone each year. And we are, as yet, nowhere near that rate of loss (although we might get there in a decade or two or three). So though the recent 2012 Greenland melt high mark was likely enough to push AMO negative, to further weaken AMOC, to develop a cool pool in the ocean south and east of Greenland, to back a super hot Gulf Stream up to the US East Coast during the winter of 2014-2015, and to set off a slew of nasty weather impacts for the North Atlantic from 2012 through 2015, it was nowhere near enough to upset the overall long-term, human heat-driven Arctic melt trend. If such an event were to occur, what we would likely see is a signature not only of a North Atlantic cool pool but also of more ice in Baffin Bay, more ice in the North Atlantic itself and more ice on the Arctic side near Greenland. A signal that we do not fully see at this time. It is thus more likely that we will see a re-assertion of the overall Arctic sea ice decline trend. And there are a growing number of indicators that some of this re-assertion is starting to come about during the summer of 2015. For the Summer of 2015, melt has been consistently strong — especially for July. During most of the month, strong high pressure systems dominated. This situation led to compaction, storm formation at the sea ice edge, and a degree of sea ice export. It amplified solar insolation at a time when the sun was near its seasonally highest angle — enhancing surface melt and melt ponding. As of yesterday, the major extent monitors — JAXA and NSIDC — as well as Cryosphere Today’s area monitor were all below or well below the 2014 line. The ongoing and rapid July melt drove JAXA below the 2014 line late last week while NSIDC hit below 2014 just yesterday. As a result, NSIDC sits at 7.2 million square kilometers extent or 7th lowest on record (a decline of 2 places since last week) and JAXA shows a 6.79 million square kilometer extent or 5th lowest on record in the measure (also a decline of 2 places). Cryosphere Today’s area measure, meanwhile, continued to drop — showing increasing divergence from the 2014 line and hitting a 4th lowest area on record for the 27th (a one place dip from last week). Neven’s most recent post over at the Arctic Sea Ice blog provides a bit more detail regarding these trends. Of particular interest to me was the most recent and significant drop-off in the CAPIE index. A drop off of this kind indicates both a high degree of melt ponding and large gaps and areas of open water behind the sea ice edge. We particularly see this now in the Beaufort and Chukchi seas — both regions that have been turned into ice cube ponds over the past month. Perhaps more concerning, however, is the impact of high heat and transport in the regions of thickest ice north of Greenland and the Canadian Archipelago. Ice fracturing there is notably high as is melt ponding. 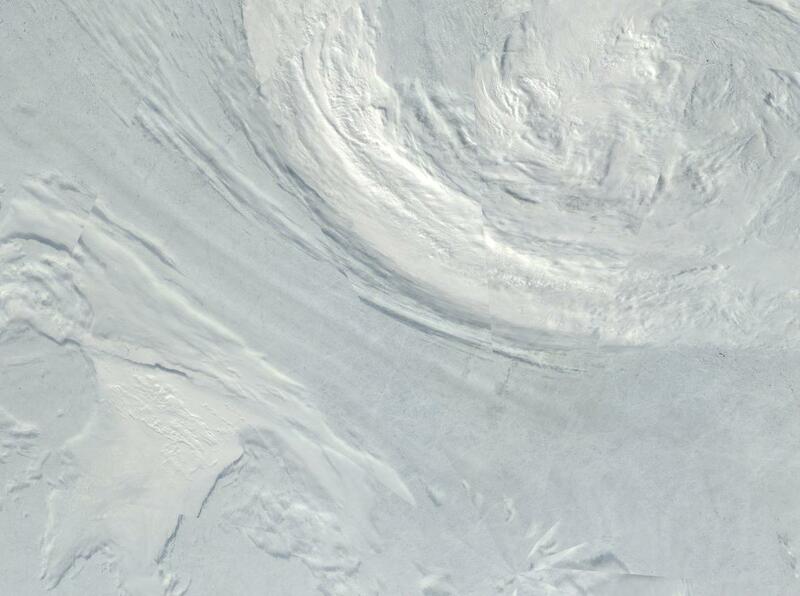 But even more concerning is the development of a large polynya that now extends through most of the thick ice region. Overall, these drop-offs are consistent with a returning to the long-term melt trend in 2015. But it does not yet place 2015 in striking distance of new all-time record end melt season lows set during 2012. And we’d be quite surprised if it did. Larger ocean and atmospheric teleconnections tend to drive increasing heat in the Arctic ocean waters and airs and to increase sea ice transport to compound ice weakness during El Nino year +1 and El Nino year +2. The most recent record lows both occurred 2 years after El Nino (2007 and 2012). Given the large ocean and atmospheric drivers related to this trend, we may look to next year or, more possibly, 2017 as potential new record low years. All that said, it doesn’t mean that 2015 cannot surprise us or (2005, an El Nino year, was also a record low year), at least, serve up some interesting features. Notably, there’s a change in the weather on the way. 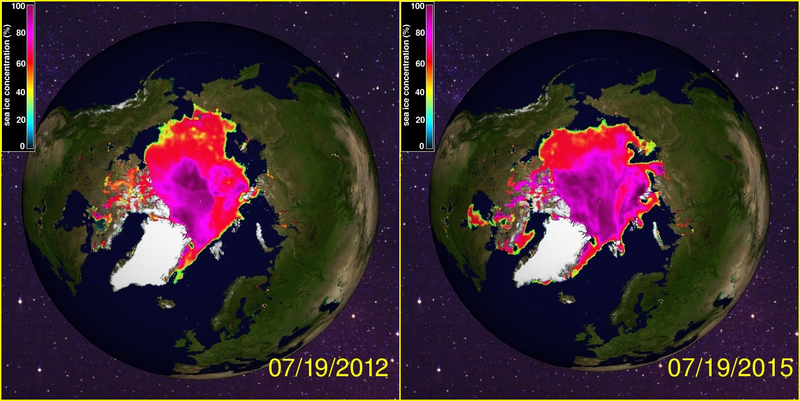 Throughout July, we saw what was, perhaps, the worst possible atmospheric regime for sea ice melt during that month. Atmospheric heat was relatively high, clear skies dominated allowing for enhanced surface melt through direct solar heating, and the persistent high pressure systems helped to drive compaction and export. Though the action of gyres moving ice out of the Fram Strait was relatively moderate, overall melt conditions were very strong. Now, however, the high pressure is sliding increasingly to the Siberian side of the Arctic. Meanwhile, a persistent storm is beginning to take hold over the Beaufort Sea and Central Arctic. Overall, it’s an increased storminess for the Arctic. One that is now driving 25-35 mph winds through the shattered ice sections of the Beaufort Sea. There’s some argument that storms are friendly to sea ice. And, perhaps, this is more true during the June time-frame when storms can reduce insolation and melt ponding. When they can spread the sea ice out to increase overall albedo. But in the current melt regime, sea ice is, overall, far more fragile. There is more latent heat in the Arctic Ocean that is available for storm systems to tap in order to melt ice. And it is this condition that is most at play as we enter late July and early August. Over the next five days, the current storm is predicted to persist over the Beaufort. It will rumble along, sending its 20-35 mph winds out over the fractured multi-season ice and large stretches of open water. It will linger, gobbling up little storms rushing north over Alaska and the Bering. And it will lash the ice there with increasing wave action, breaking the surface cool water cap and pumping warm water up toward the ice from below. In addition, this Beaufort low will form a kind of dipole with a high pressure system that will tend to remain on the Kara Sea side of the Arctic Ocean. The net effect of the dual circulation of the high over the Kara and the low over the Beaufort will be to lift the thick ice away from its base of support along the Northern Canadian Archipelago. The result is likely to be a continued widening of a large polynya already developing there. Meanwhile, milder compaction and sea ice retreat is likely to continue on the Siberian side with ice recession particularly likely in the Kara, Laptev, and East Siberian Sea regions. Overall, these factors should continue to drive melt enough to keep the monitors at or below the 2014 line with particular risk of increased divergence in the area measure over the coming week due to storm activity in the Beaufort. There is an outside, though not entirely negligible, risk that Beaufort storm activity will greatly impact the already very fragile ice along the Chukchi Sea boundary toward the Siberia side. Such an impact would result in still greater area and extent impacts. But more likely is an enhanced winnowing of the remaining multi-year ice together with a widening of the large polynya north of the Canadian Archipelago. If one were to search for an example of the utterly and inherently life, climate, and economy destroying impacts of fossil fuel burning, they wouldn’t have to look too far. They could look to the rapidly destabilizing glaciers now putting our coastal cities, our island nations in dire peril. They could look to the droughts now ranging the world, forcing officials in Sao Paulo to make water out of mud, lighting understory fires in the Amazon rainforest, and setting off water scarcity crises from the US West Coast, to the Caribbean, to South America and on through broad sections of Asia and Africa. They could look to the nation-destabilizing crises that have already rippled through our world. The collapse of Syria due to drought, the fractures running through both India and Bangladesh due to sea level rise, the immigration camps Australia has already set up to deal with a rising tide of island migrants — driven from their homes more and more by increasingly extreme weather and the swelling seas (see also Australia’s Immigration Detention Facilities). 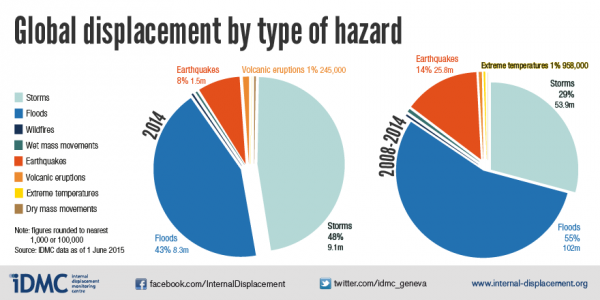 158 million persons were displaced by extreme weather over the past 7 years. 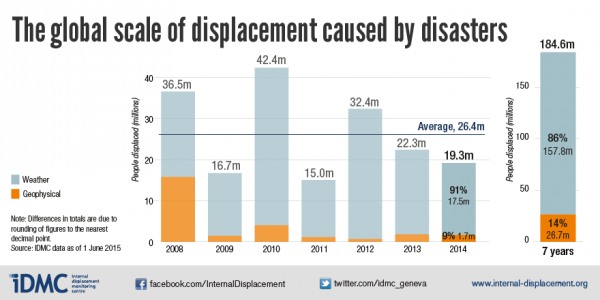 A flood that has swelled the ranks of refugees inundating the developed countries of the world from Europe to North America to Southeast Asia. And all this just a brief and incomplete overview that doesn’t include the massive wildfires, the great species displacement and winnowing, the coral reef bleaching, the ocean dead zone expanding, or the amplifying feedback inducing nature of the 1 C warming we’ve experienced since the 1880s. 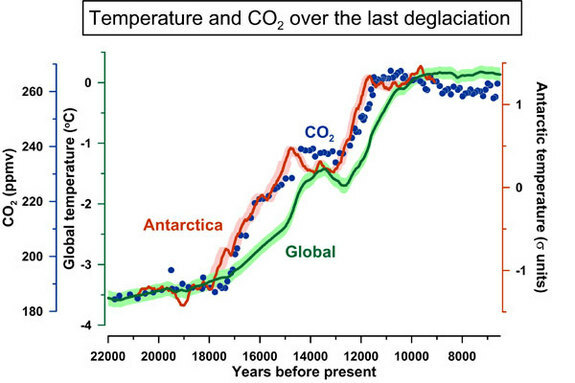 More than 1/4 of the warming experienced over 10,000 years at the end of the last ice age. But this warming all crammed into a mere 135 years. 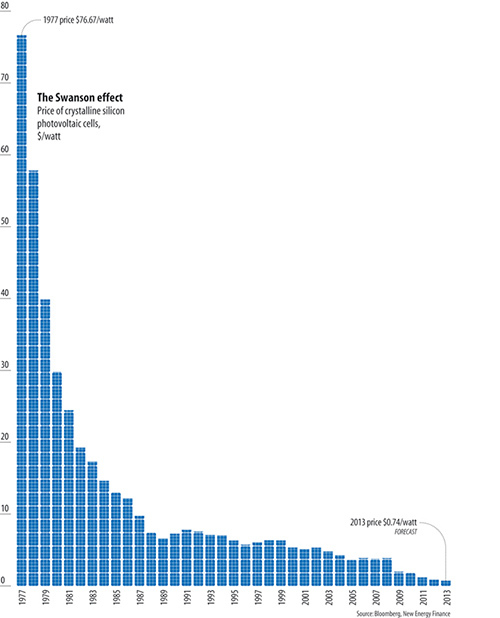 A warming set off by a massive burning of fossil fuels that has continued to ramp higher to this day. A warming that will continue to worsen, setting off an age of Storms leading to a hothouse world that is not at all friendly to life or human habitation — if we do not stop lighting fossil fueled fires. If one were to encapsulate all the destruction that we are now beginning to witness due to our mad continued combustion, we might set the scene in Alberta. There a massive tar sands operation continues to unearth some of the most expensive, the most high-carbon fuels in the world. There they break rocks to leech out an oily bitumen. There they burn natural gas to enrich the bitumen with hydrogen before shipping it south to the US for further refinement. It’s an ugly process that has gouged great furrows in the earth, destroyed the great carbon sequestering boreal forests — leaving hundreds of square miles of wasteland and a vast pollution of waters and airs in the wake of its operation. It’s a process that’s aiding in the burning of Arctic permafrost. A process that warms the permafrost to thaw and then turns it into a kind of peat-like fuel for the wildfires that have now become a feature of an annual season of burning in the Arctic. A vast ripping and combustion of the once frozen biomass, adding to the fury of our fossil fuel warmed future. 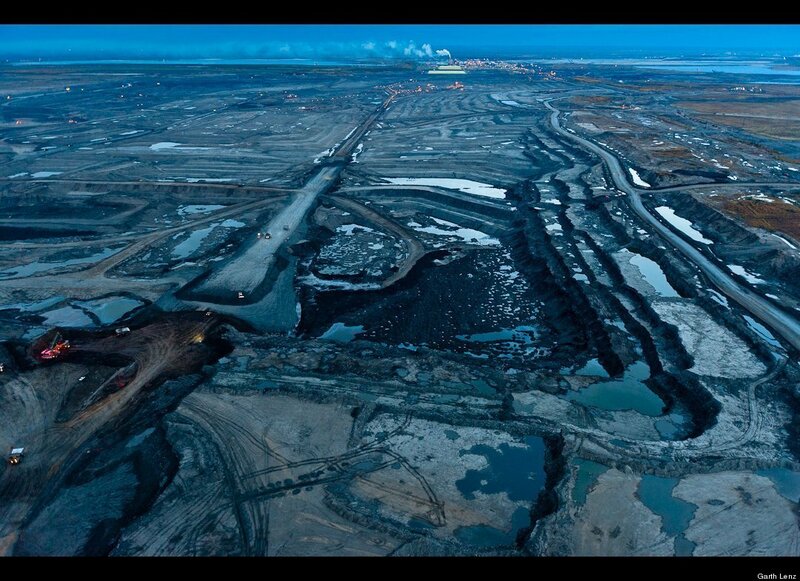 This year, a massive wildfire encroached upon the tar sands operation itself. The fire raged close enough to one of the major production centers to force it to shut down some of its operations. As a result 220,000 barrels per day of tar sands production was shut in by some of the massive wildfires the operation itself has helped to drive. Just one more ironic twist in the violent history of a resource that has been called The Prize, but that may as well be considered The Curse. And this year it appears that a number of investors are starting to get it. Get the fact that there’s no future left in burning coal, oil or gas. No future worth living in at least. For investors by the droves are now engaged in removing their assets from fossil fuel based companies. Some are being pushed out by divestment campaigns run by responsible college students. Students who look to the future and don’t like what they see and so, encourage their schools to scrub carbon emissions from their investment funds. It’s a campaign that has also touched churches — including the great Catholic Church itself — setting off a broadening wave of religious-based divestment. And it’s a campaign that has reached into the sovereign wealth funds of entire nations. Still more are being shoved along by a death spiral of coal, oil and gas prices. A wholesale disintegration of the paper billions of dollars once claimed on fossil fuel company balance sheets. A disintegration led by plummeting demand for fossil fuel products due to a combined increased efficiency and an ever more rapid adoption of non carbon based energy sources. Though some are rendered deaf by greed or cynicism, the message is loud and clear. If preserving a just and functional human civilization is the underlying basis for morality, then there’s nothing more amoral than continuing to burn fossil fuels. But not only that, there’s no future in it. For if the use of this kind of energy destroys the very reason for having energy in the first place — living, playing and working in a world in which natural wealth exists at all — then there is no economic justification for continuing its use. As a result of its running counter to both sound morality and rational economics, the future for fossil fuels looks increasingly bleak. For individuals, societies and investors are faced with a choice between stranded fossil fuel assets and a world undergoing a new mass extinction likely worse than the Permian. One of these choices is survivable by human civilizations, and the other one is not. 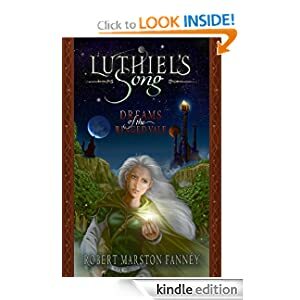 It is perhaps for these combined reasons and due to the encroachment of ever-more inexpensive and accessible renewable energy sources that has led to a massive flight of capital away from fossil fuel based energy. Arch Coal, for example, has lost 95 percent of its market capitalization in the past year. Other corporations who’ve cast their lot with continued fossil fuel burning have suffered similar, though slightly less dramatic fates. Suncor, one of the chief tar sands extractors, has lost 20 percent of its value, Exxon Mobil 12 percent, Chevron 18 percent, Chesapeake Energy 55 percent, Conoco Phillips 24 percent, Suncoke 36 percent, and Peabody 85 percent. These are industry-wide losses that are in the process of setting off a string of malinvestment-based bankruptcies that would put the ‘tempest in a teapot’ hype surrounding Solyndra to shame. In essence, it’s the epic and compounding failure of drill, baby, drill politics. Investors told late last year that oil, gas and coal fortunes would rebound have been sorely disappointed. Coal continues its 5 year long string of monthly bankruptcies. Oil and gas companies trail the S&P 500 by 40 percent. And more than 118 billion dollars in new oil projects has now been shelved. Growing ever more sour on what appears to be an escaped-from-reality chorus of fossil fuel cheerleaders, investors have finally had enough and gone in search of greener pastures. In this case, green pastures include a wind farm now being built off Cape Cod. One that will provide renewable energy based electricity to 30,000 homes that previously got their electricity through dirty, expensive and hothouse-amplifying diesel fuel burning. I’ve got a really bad feeling about this. That feeling has been building up over the last few months. Every time I see an anomaly map these days, I can’t help feeling that we in the UK are right in the firing line of Greenland ice melt, and the firing might have already started. It’s starting. Climate change changes everything — makes our world, our nations and our homes less secure, more vulnerable in the path of oncoming and ever more violent weather. But, if Hansen and other scientists have it right, we can still avoid the worst impacts if we don’t listen to the fossil fuel cheerleaders and keep making all the wrong choices. Thankfully, it appears investors may have wised up a bit. Let’s hope that trend continues. 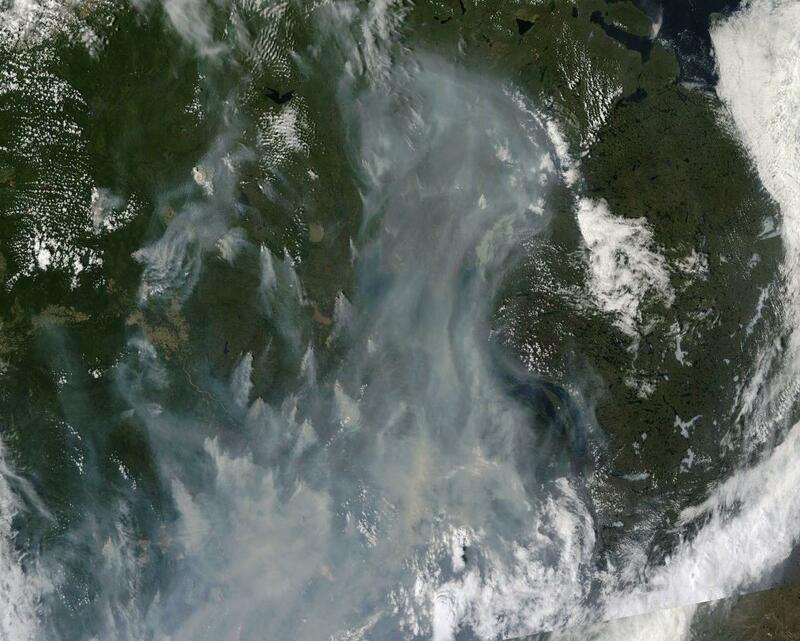 A bad wildfire year for the US and Canada just got that much worse. 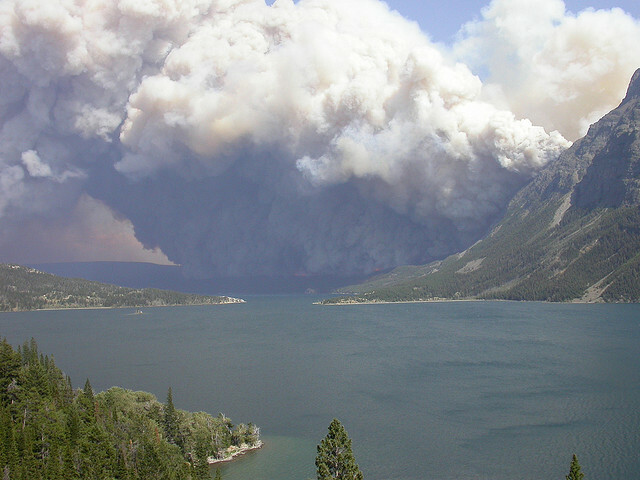 As of yesterday a fire had ignited in Montana’s majestic Glacier National Park. As of today, the fire had consumed nearly 3,000 acres and it’s still growing. In other words — Glacier National Park, a national monument, a natural wonder, a place known for its towering glacier-capped peaks and frozen valleys, is now on fire. Strong winds and low humidity combine to generate what fire management officials call — ‘explosive fire growth potential.’ These conditions allowed the fire to burn over 1,000 acres during just a few hours yesterday and to rapidly expand to cover nearly 3,000 acres today. The fire there has now spurred officials to order a complete evacuation of St. Mary’s Park and to suspend all activities until further notice. A 50 mile long road running through the park has also had 21 miles blocked off to traffic. Type 1 incident management teams are now en route to the blaze which is still growing. 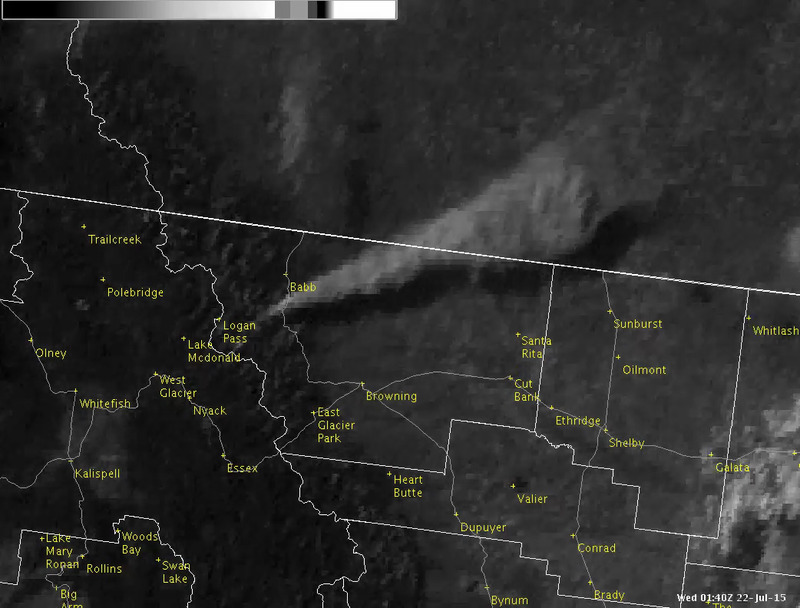 The fire occurs as other blazes are now popping up throughout both Montana and Washington. East of Glacier National Park, the Cabin Gulf Fire also exploded to 1,000 acre size yesterday — drawing the firefighting efforts of 10 aircraft and dozens of hot shotters. In southeastern Washington, more than 600 firefighters battled a single blaze that had consumed more than six square miles including one residence. 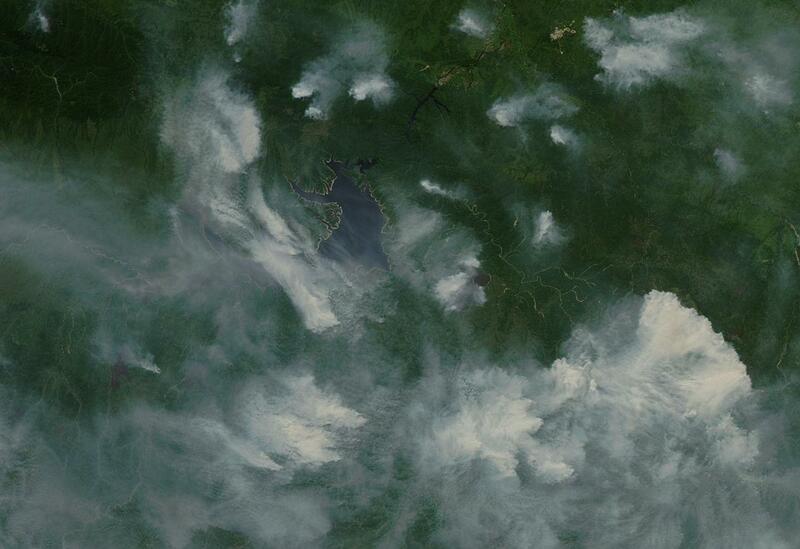 Across Washington other forest areas, including rain forests, were also experiencing a widespread fire outbreak. The glaciers of Glacier National Park have greatly retreated during recent years. Many once snow-capped peaks now show only the gray-brown of naked granite. This multi-decadal melt, driven by a 1 C warming of the global climate since the 1880s, has also set the stage for more fire vulnerability. A vulnerability that, this year, hit a new high extreme as powerful heatwaves invaded Montana as well as much of the Canadian and American west. 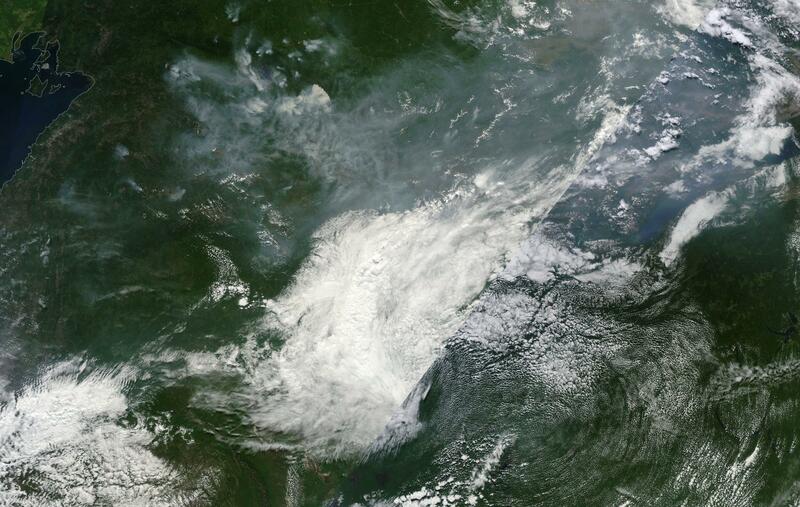 Many regions are now experiencing record wildfires for June and July. Now Glacier National Park can be added to that grim tally. Under an oppressive human fossil fuel emission, the world just keeps getting hotter and hotter, the 2015-2016 El Nino just keeps looking ever more monstrous, and reports of tragic, heat-related, mass casualty events just keep rolling in. JULY 21, 2015: All the major climate monitors have now chimed in — NASA, Japan’s Meteorological Agency, NOAA. And June of 2015 is now marked as the hottest recorded in every single one. But of these, the NOAA measure, which provided its Global Analysis report yesterday, clearly is the starkest. Showing extraordinary warming, June of 2015, according to NOAA, hit +0.88 C above the 20th Century average. That’s an excessive leap of +0.12 C over last year’s previous record June measure showing a +0.76 C global temperature departure and just 0.02 C behind the all-time monthly record values for any month hit just this year during February and March (+0.90 C). When compared to 1880s averages, June was fully 1.08 C hotter. That’s more than halfway to the (not safe) 2 C threshold which IPCC has marked off as the point where catastrophic impacts from human caused climate change really start to hit high gear. We can clearly see the progress of rapid warming over the past 136 years in the above graph. Particularly since 1980 — when global temperatures really started to hit a rapid ramp up. Note that the mythological pause is not at all evident in the above graph. 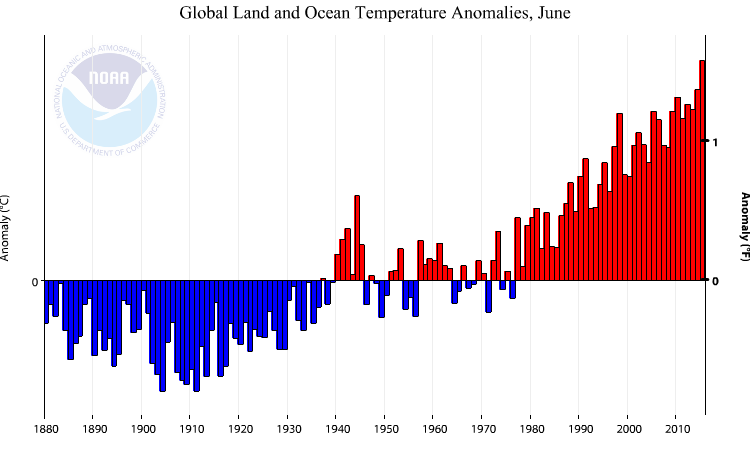 Global temperatures through June measures just kept driving on — higher and higher. With all the June measures coming in so strongly on the hot side, and with the first half of this year already substantially warmer than the previous record warm year of 2014, it appears that we are locking in for back-to-back years of record heat. These new records are occurring in the context both of the larger, human-forced warming trend and as we hit the warm end of the global natural variability scale — El Nino. And propelled by that human warming escalator, the current El Nino jump is starting to look absolutely savage. For today’s Australia Bureau of Meteorology (BoM) report showed the current El Nino striking down yet another 1997 record. According to BoM findings, all key Nino ocean zones have shown surface temperatures in excess of 1 C above average for 10 successive weeks. 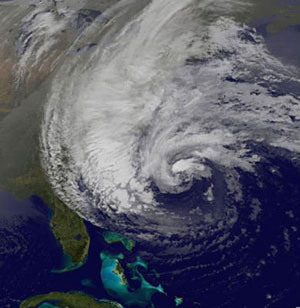 This shatters the previous record duration for such an event — occurring in 1997 at 8 weeks in length. Notably, the current record heat build for Nino zones is still ongoing. So the new, 2015 record could extend further. Taking in this shot, it’s worth pausing for a moment to appreciate the fact that not only is the Equatorial Pacific outrageously hot, the entire Northern and Eastern Pacific from the Arctic on south is just off-the-charts hot. 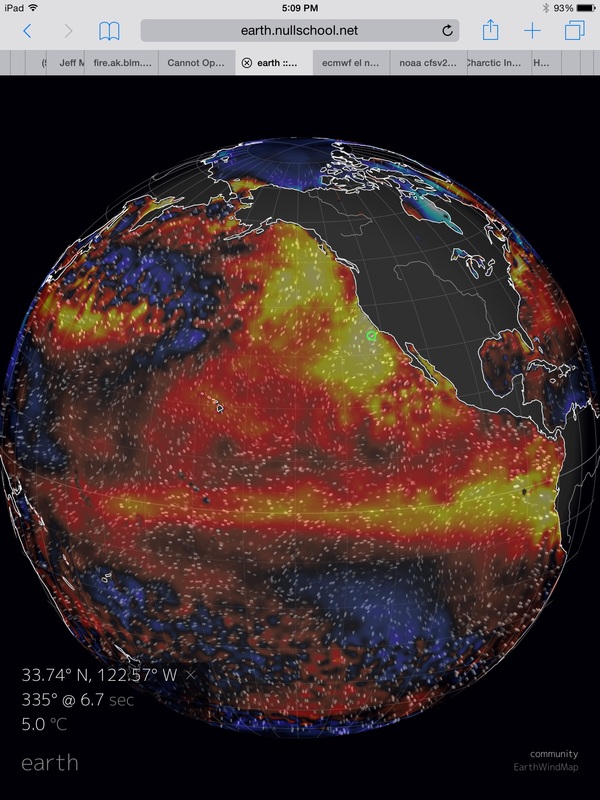 If you ever wondered what the emerging face of a Godzilla El Nino looks like, well, just remember this shot. NOAA, meanwhile, shows El Nino continuing to extend its foray into strong event range. The critical Nino 3.4 measure of Central Pacific Ocean temperatures jumped again in the July 20 weekly report — hitting a +1.7 C anomaly. This is jump up from last week’s +1.5 C measure and is now knocking on the door to a super El Nino threshold of +1.8 C. NOAA’s three weekly reports for July now average +1.53 C for the Central Pacific — solidly in strong El Nino range for the month. NOAA also began to track a third warm Kelvin Wave running across the Pacific. This Kelvin Wave is propagating eastward as a result of a strong West Wind Backburst that has blown over the Western Pacific throughout much of July. 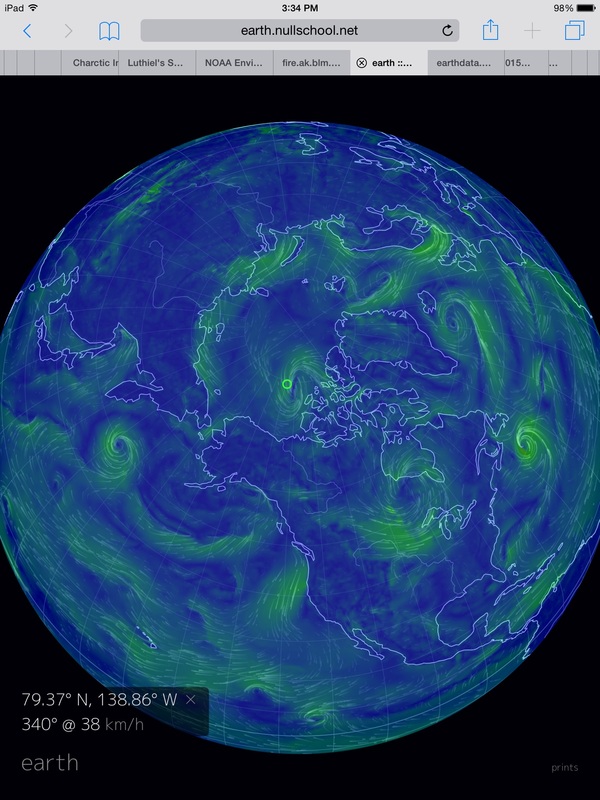 These winds are pushing warm surface waters down and under the Equatorial region. Ocean heat that will resurface off South American. Recharging already hot waters with a new hot influx and further strengthening an already strong El Nino. The signal of this new warm water flood is now really starting to show up in the model runs. Corrected seasonal models now show an event in the range of 1997-1998. Uncorrected runs, including the Euro ensemble, continue to show potentials for an event that would make the 1997 Super El Nino look tiny by comparison. Typically, El Nino reaches peak strength during Northern Hemisphere Fall and Winter. So we’re in a ramp-up phase that could last through October and November and we are already starting to hit strong event values in July. The current El Nino is predicted to remain a feature until late Winter or early Spring of 2016. Strongest global temperature heightening impacts come during and slightly after peak ocean warming due to El Nino. So the temperature records we’ve seen so far in 2014 and 2015 may just be prelude to the main event. It really is the kind of global heat spike that you don’t want to see. The kind that enables heatwaves to put droves of people into hospitals with life-threatening heat ailments. Earlier this summer, both India and Pakistan suffered mass casualty heatwave events. Instances that filled hospitals with tens of thousands of patients. In India, 2,500 souls were lost. In Pakistan, the number hit 1,242. These represent the 5th and 8th most deadly heatwaves on record, respectively. Now, reports are starting to trickle in that Europe and Japan are suffering similar, although still somewhat less acute mass casualty events due to record heat. According to Dr. Jeff Masters, excess mortality due to heat had claimed more than 1,200 lives across Western Europe through early July. Meanwhile, reports are also starting to trickle in from Japan of heat related mass casualties. A report last week from Japan’s Fire and Disaster Management Agency found that 3,000 people had been admitted for heat stroke to hospitals across the island nation during the period of July 6 through 12. 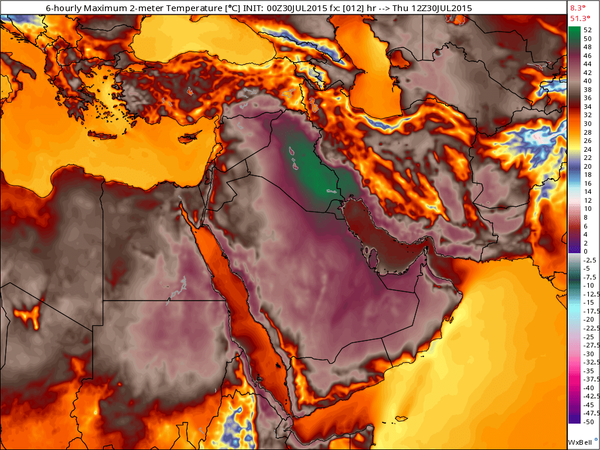 Over the next few days, record-breaking heat is again expected to invade parts of southern Europe, setting the stage for more potential heat casualties. All time record high global temperatures for 2015 and likely at least a decent period during 2016 means we are also likely to continue to experience odd and severe weather conditions over many regions of the globe. A fact that was punctuated in Southern California earlier this week as the remnants of a tropical cyclone dumped 1.69 inches of rain — or more than ten times the amount of rainfall typical for July — over parts of San Diego through Monday. Possibly a taste of what’s to come for California should the currently building Godzilla-type El Nino — pumped up by a catastrophic rate of human greenhouse gas emission — crush the West Coast blocking pattern and hurl a barrage of powerful storms at the drought-parched state. A situation many may be hoping for at this time, but which they could easily come to regret as the extreme intensity of weather switches in the new climate age of 1 C warming start to become evident. It’s a pretty well established theory. If snow over the Northern Hemisphere land and sea ice masses substantially melts during May and June, it can tend to set up a general weather pattern that is conducive to large-scale reductions of the Arctic sea ice come July, August and September. And, during June, we saw just this kind of trend emerge. Arctic heatwaves over both the Continental land masses and the Arctic sea ice resulted in a rapid melting of snow cover. Heatwaves fed by massive bulges in the Northern Hemisphere Jet Stream, particularly along the now-famous Ridiculously Resilient Ridge over what is today an amazing (horrific) hot zone of Northeastern Pacific surface waters. El Nino and Positive PDO played their role too, kicking up the hot zones and the ridge to ever greater intensity. 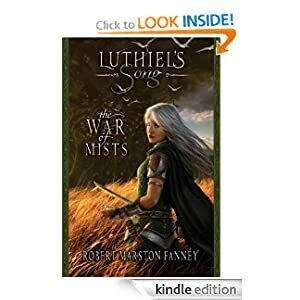 An atmospheric and ocean synergy in a 1 C hotter than 1880s context that kept hurling more and more heat into the Arctic environs. Melting more snow and setting the stage for a potential sea ice massacre to come. By early July there were indications that just such an event may be on the way. A ‘heat dome’ type high pressure system had become well established over the Greenland side of the High Arctic. And for the past three weeks now, this high has remained entrenched. A persistent weather pattern that has allowed more sunlight to hit the sea ice during periods of peak insolation, a pattern that compacts sea ice in the Central Arctic, a pattern that draws storms into the Siberian side of the Arctic to chew away at the ice edge, and a pattern, that overall, drives the ice inexorably toward its Atlantic Ocean flush valve in the Fram Strait. All this extra heat, transport, compaction and storms chewing away at the sea ice edge has finally started to take a very serious toll. As of today, sea ice extent measures had dropped from 7th to 10th lowest on record to 6th to 7th lowest. Area has remained at 4th to 5th lowest on record for the date. Meanwhile volume in the DMI measure has dropped to 2nd lowest on record. Most charts now are starting to show a steep ‘cliff’ type rate of decline indicative of rapid sea ice collapse. This is particularly true in NSIDC’s Charctic and Cryosphere Today’s sea ice graphs which now show both extent and area lines plunging at rates that will rapidly cross new thresholds if they continue over the coming days. 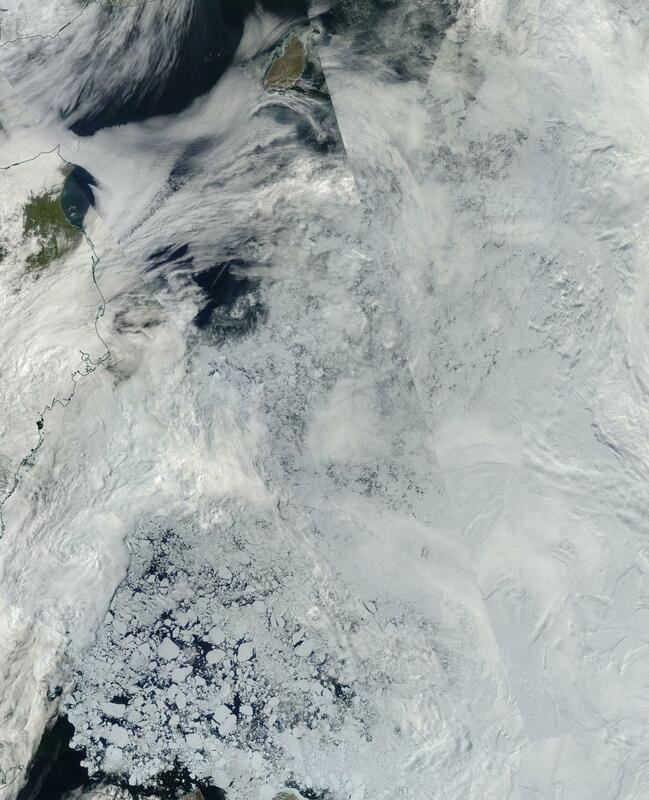 Comparing the left frame image with the MODIS satellite shot at the top of this post, we find confirmation of an overall, very weak sea ice state. Concentration throughout the Arctic appears low. 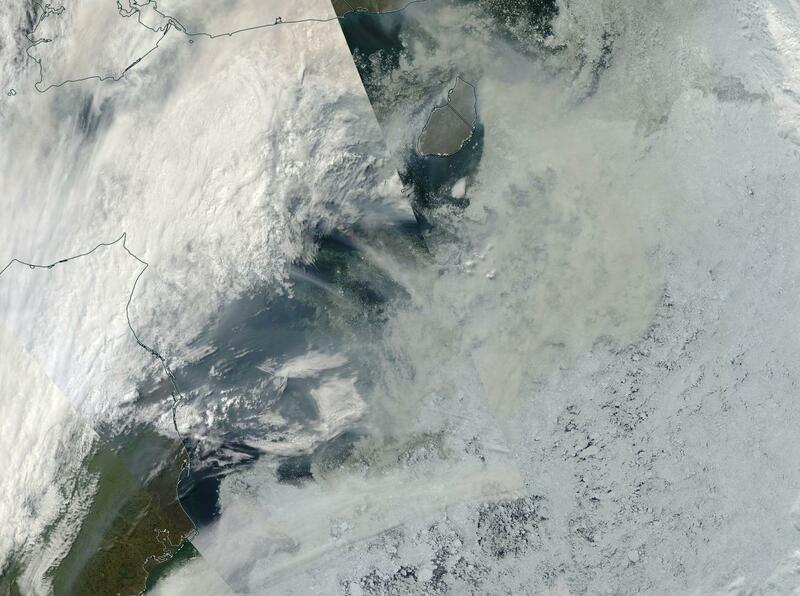 This is especially true on the Beaufort, Chukchi and East Siberian Sea side (see MODIS shot at bottom of post). But extensive weakness and low concentration appears to pervade the entire ice mass. 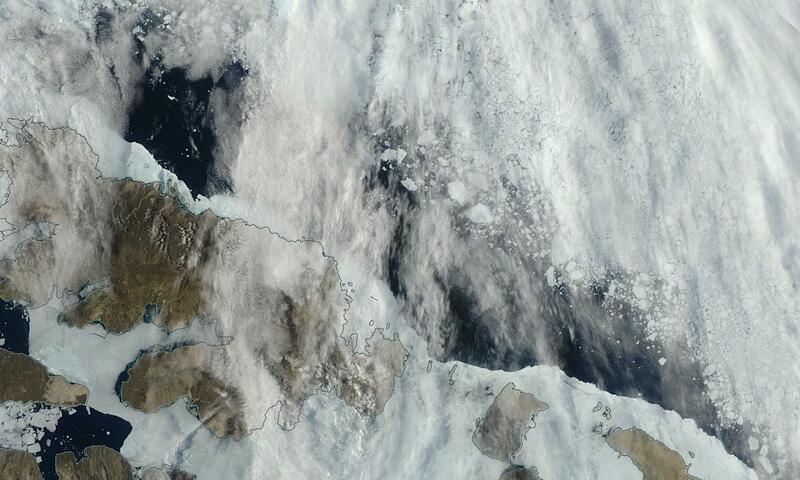 Zooming in on the sea ice surface, we find that some of this low concentration is possible to confirm. 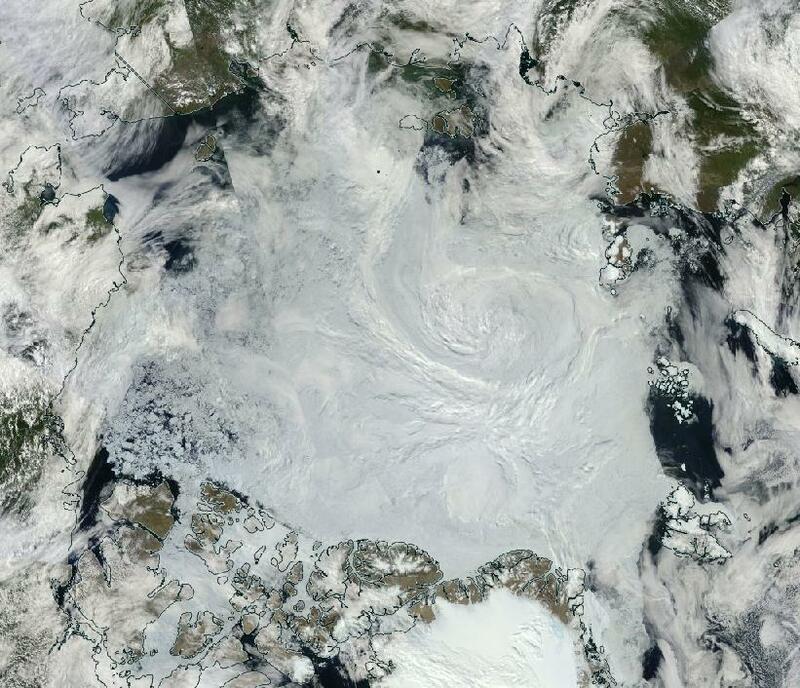 The entire Arctic is now full of broken floes, polynya and melt ponds. Above, we see very low sea ice concentration practically anywhere outside the 80 degree North Latitude line. Most notably, concentration is very thin and rapidly weakening in the Beaufort, Chukchi, East Siberian, and Laptev Seas. And the seven day forecast shows very rapid melt throughout all these regions with the low concentration bulge beginning to invade north of the 80 degree line on the Laptev and ESS side in particularly troubling fashion. So the question, going forward, is — what next? And it appears that the sea ice is being prepped for continued rapid to accelerating melt over at least the next 7-10 days. Seven day forecasts show the ridge remaining on the Greenland side of the Arctic throughout the period. A position that will continue the current melt, transport and ice weakening regime. Longer range, ten day, ECMWF forecasts find the high shifting more toward a strong ‘heat dome’ located in the Central Arctic with a somewhat weaker high remaining over Greenland — a minor variation of the current ice-weakening state that may slow down ice export but leave compaction, melt ponding, heat build-up, and ice edge weakening due to storms in tact. Due to this weather forecast and due to some observations beginning to come in line with ARCc model runs, we cannot rule out a very rapid melt and recession of sea ice along a broad arc running all the way from the Canadian side to East-Central Siberia. 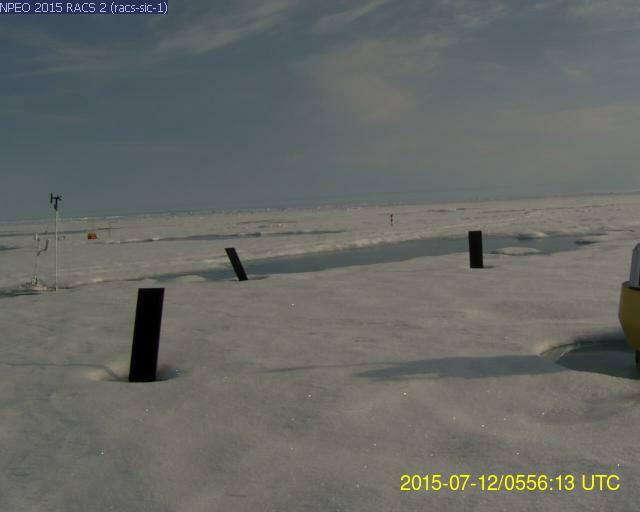 The sea ice is visibly very weak there. Perhaps the weakest we’ve ever seen it for this time of year. Ice that will continue to be pulled poleward by the highs that are forecast to remain in place. Ice that will run into weakened, melt pond invaded ice — a paltry respite for its retreat. And ice that will continue to be harried by edge storms and an influx of much hotter than normal air and water from the Pacific Ocean side. It’s a rapid melt risk that calls into effect the potential that some old sea ice area, extent, and volume records may be challenged or broken — probably not 2012’s all time low marks, but more possibly 2011 or 2007. It’s, overall, a very tenuous situation for sea ice, one that is continuing to be fed by a growing El Nino and still firmly entrenched RRR to the south. So the evolution of sea ice melt over the next few weeks will likely be a critical game-maker for the state of Arctic Sea ice melt and the overall story of Arctic Sea Ice decline in this sad age of human-forced climate change. With El Nino settling into a strong-to-monstrous mode and with the world now baking under 1 C of global temperature increases since the 1880s, a large swath from South American through to the Caribbean is suffering from extreme drought. As we can see in the above map (provided by NOAA) most of South America is experiencing the impact of significant to severe rainfall deficits. Northern Brazil and the Amazon Rainforest are at the epicenter of water losses. But Colombia, Venezuela, Argentina, Chile and Peru all show substantial drying. It’s a drought that stretches all the way up into the Caribbean. One that has set off water rationing over broad regions. Even the US territory of Puerto Rico hasn’t been left unscathed by this wide-ranging drying. There, 160,000 residents and businesses have seen water turned off for 48 hours and then back on for 24 hours. Another 185,000 are losing water services in 24-hour cycles, a further 10,000 are on a 12-hour rationing plan. A hand of drought that had, as of last week, stretched its desiccating fingers all the way to South Florida — setting off wildfires and sending billowing plumes of smoke into Palm Beach skies. 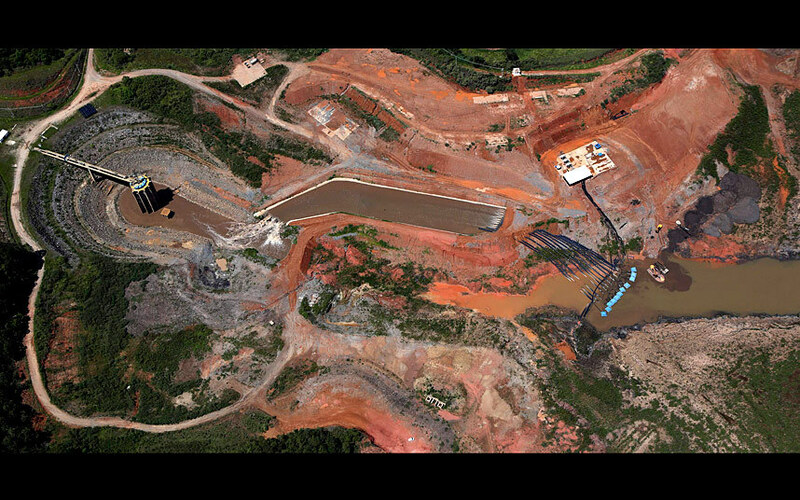 Essentially, in order to provide water, Brazil’s utility managers have been forced to put pump lines in the bottom of the muddy Cantareira reservoir. You can see the heads of these pumps as blue boxes in the above image. The pumps then feed the dead pool water into a spill-way that contacts the old water pump which is now too high in elevation to draw water from the drastically diminished pool. The Cantareira reservoir is Sao Paulo’s largest, its most essential. At most, it contains about 40 million cubic meters of water remaining before it is bone dry. And it’s losing this water at a rate of 200,000 cubic meters each day. Even worse, it’s uncertain if all the remaining water can be accessed. But if it could, it would take just 200 days to completely bottom out the Cantareira at the current rate of losses. For reference, there are about 100 days left until the rainy season starts in Sao Paulo. But with El Nino strengthening and with the Amazon Rain Forest suffering severe water losses, it is uncertain whether this year’s rainy season will arrive on time. Looking at the larger water system, the situation is equally stark. Alto Tiete, another Sao Paulo reservoir will reach a dead pool situation similar to the Cantareira in just 90 days at current rates of loss. And the entire water system of Sao Paulo will hit its maximum recoverable water in less than a year if losses are not somehow abated. With the situation so stark, Sao Paulo water managers have drastically cut back on water outlays to the population. In total only about 54 percent of the typical outlay is reaching the public. The result is a very severe and ongoing situation of water rationing for the metropolis. 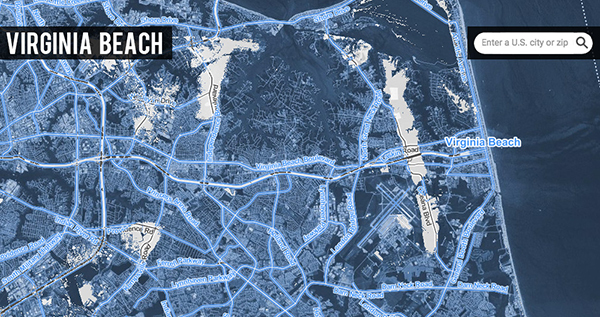 But even worse would be the near complete loss of Sao Paulo’s water supply. A situation the city and region faces if the rains don’t arrive soon. This week, a screaming hot Pacific basin hurled six tropical cyclones northward. These cyclones spawned off the back of a building monster El Nino which is predicted to reach strong-to-record intensity by later this year. They also contributed to setting a record for number of cyclones formed in the Northern Hemisphere so early in the year. In the Western Pacific, one of these Cyclones — Typhoon Chan Hom — slammed into Shanghai on July 10th and 11th, delivering high waters, high winds and floods. 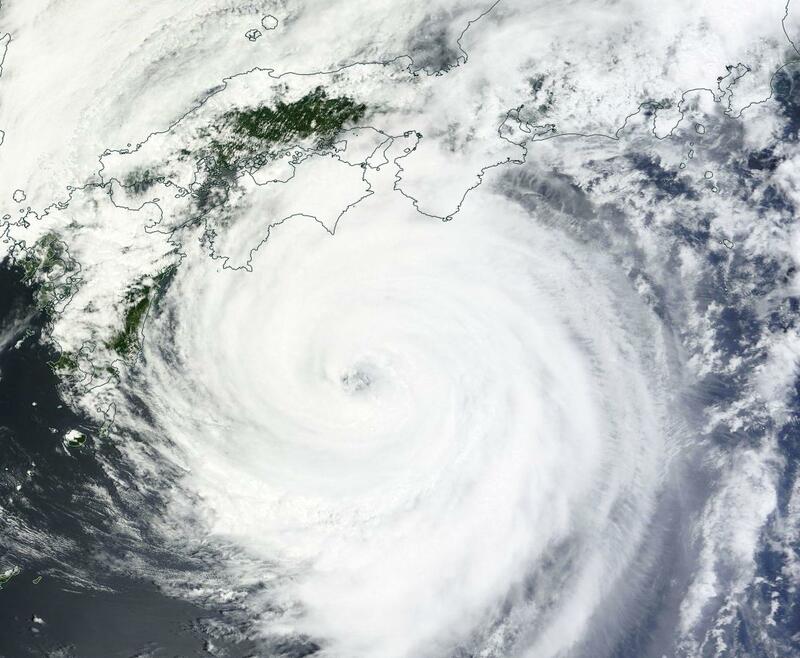 Now, another cyclone — Typhoon Nangka — is venting its fury on Japan. A few hours ago, Nangka made landfall near Muroto City. Over the past 24 hours, Nangka had weakened from a category 3 storm packing 115 mile per hour intensity, blustering ashore as a minimal Typhoon with 75 mile per hour maximum sustained winds. Nangka is interacting with a frontal boundary, which interfered with the storm’s circulation even as it injected massive amounts of moisture into Nangka’s encircling thunderstorms. This increased moisture loading — likely also enhanced by global temperatures that are now in the range of 1 C hotter than 1880s averages together with moisture bleeding off an anomalously warm Pacific — is resulting in forecasts for up to 1 meter of rainfall as Nangka continues to churn over Japan. Extraordinary additional rains that will bring with them the risk of severe flash flooding and landslides to the mountainous slopes of Japan. As Nangka continues northward, it will become wrapped up in a trough, helping to feed a larger synoptic pattern of moisture and air flow from south to north. 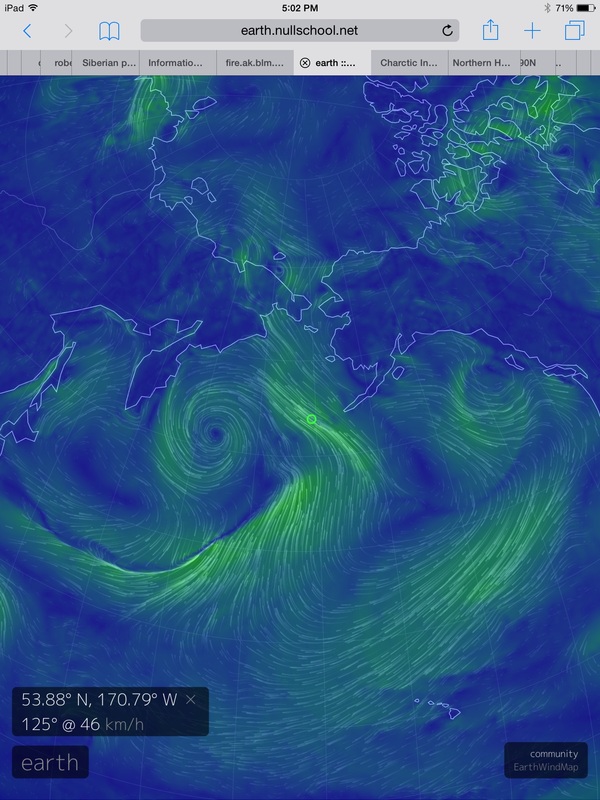 The trough, in turn, is projected to rush northward into the Bering Sea. By Monday, a dipole pattern set up between the trough running through the Bering and the Ridiculously Resilient Ridge to the east will pull warm air up from the tropical Pacific and catapult it toward the already weakened ice of the Bering, Chukchi and Beaufort seas. In the above image from Earth Nullschool and based on GFS models, we can see the strong south to north synoptic wind pattern predicted to set up. Flowing from a region near Hawaii, these winds are predicted to pull tropical airs over thousands of miles, run them up through the Bering and into the High Arctic. In conjunction with this warm air invasion, a head of hot water now at a +5 C positive anomaly in the Chukchi will be driven northward running directly into highly fractured and disassociated ice floes. It’s a weather pattern that is a continuation of consistent warmth hitting the sea ice on the Pacific side of the Arctic. One that is driven both by El Nino and by a human greenhouse gas based amplification of heat in the polar zones. This combination has generated a kind of Achilles heel for Arctic sea ice on the Pacific side for 2015. With another hit coming to this area and with sea ice already in a somewhat tenuous state due to the continued impacts of warm air near Greenland, a Greenland high and a related dipole continuing to nudge the ice toward the Fram Strait, risks rise that current sea ice measures ranging at 4th lowest in area and 7-9th lowest in extent could take a further tumble. 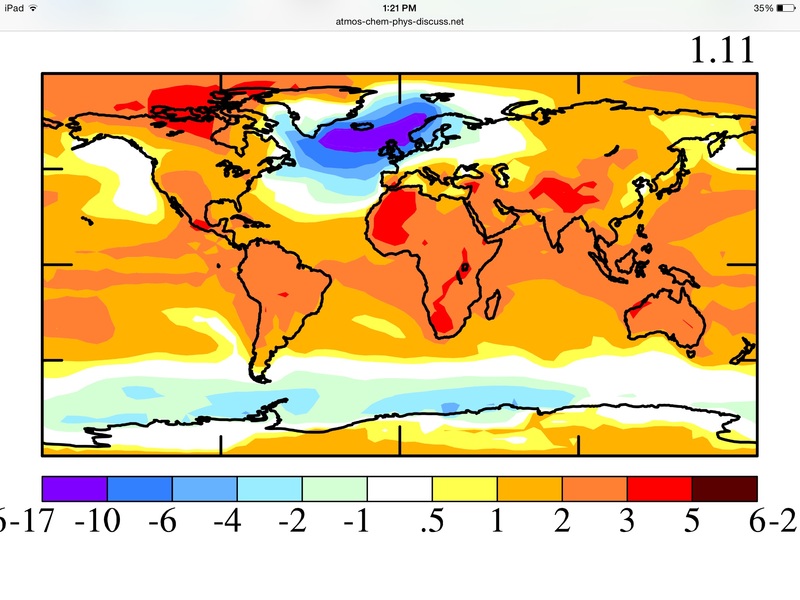 The global June temperature measures are starting to come in and indications are that the past month was a brutally hot beast. According to Japan’s Meteorological Agency, June beat previous all-time hot temperatures of 0.68 C above the 20th Century average set just last year (2014) by 0.08 C. Coming in at 0.76 C above the global 20th Century average and about 0.96 C above 1880s values, this past June was the hottest since Japan began taking measures in 1891. By comparison, El Nino years 2010 and 1998 came in as tied for third hottest at 0.51 C above 20th Century average levels respectively. 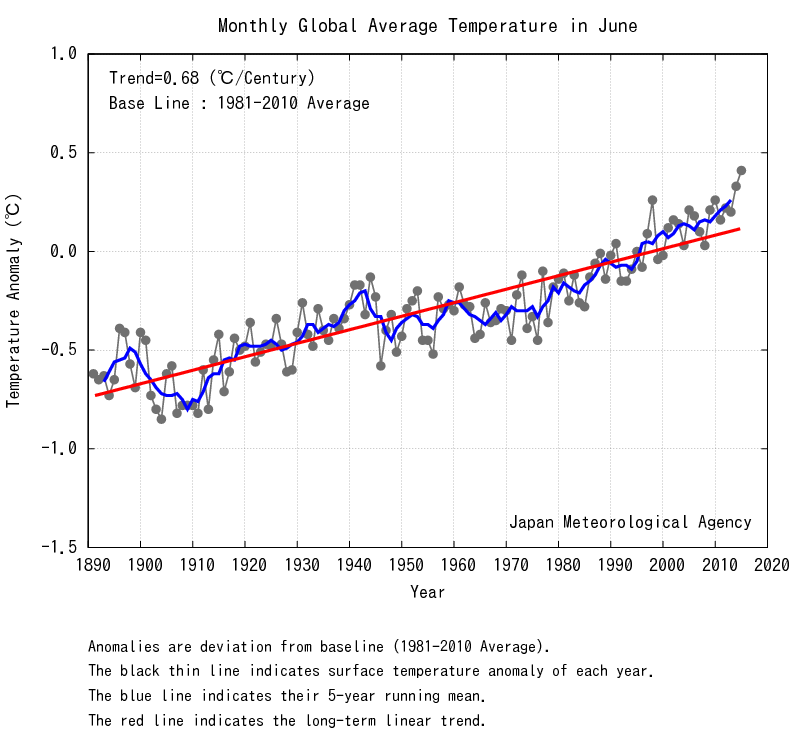 As we can clearly see in the Japan measure, June-to-June temperatures show a steady increase from the 1890s onward with most recent years warming substantially above trend line. A visible pace of warming directly at odds with recent false rumors of a global warming ‘hiatus.’ Meanwhile, the nearly 1 C worth of global warming since record keeping began in 1891 has proceeded at a pace roughly 25 times faster than the warming that occurred at the end of the last ice age. Record June heat caps off a record hot first half of 2015 amidst a still strengthening El Nino in the Equatorial Pacific as well as numerous heat-related weather events across the globe. In the US, a continuation of a severe western drought drove Lake Mead below the rationing line for the first time in its history. 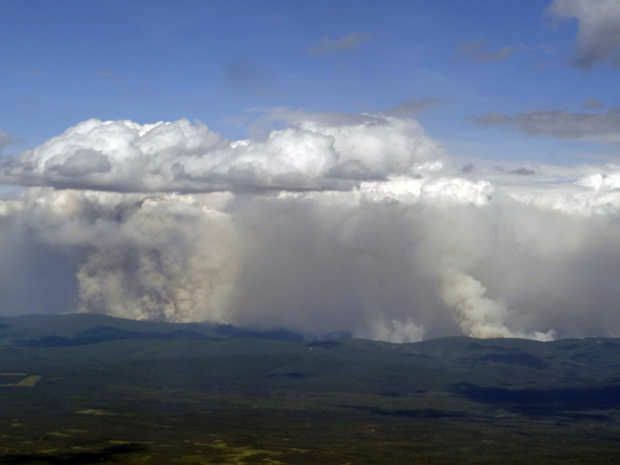 California extended extreme drought conditions and a record fire outbreak consumed more than 2 million acres of forest, tundra and permafrost in Alaska. In South America, water rationing continued in Brazil’s most populous city of Sao Paulo as severe drought conditions pervaded over much of South America, Central America and the Caribbean. In India and Pakistan severe heat and humidity pushed wet bulb temperatures to dangerous levels — setting off two mass casualty events that left thousands dead and tens of thousands hospitalized. Northern Hemisphere sea ice hit third lowest extent on record and an odd blob of hot water in the Northeastern Pacific continued to harm marine life as waters grew more stratified and toxic due to heat-related causes. So far, with El Nino still building and with global CO2 levels rising to a record 404 parts per million in May, 2015 is leading 2014 as the hottest year on record by a significant 0.07 to 0.1 C margin. Substantial westerly wind bursts during late June and through mid July have increased the likelihood that the 2015 El Nino will be a strong to record-breaking event — backing still more ocean warmth into an already over-heated atmosphere. As such, there is a strong potential that record warm global readings will maintain current intensity or even worsen through to the end of this year. “There are some recent modeling efforts that now show you could get a section of the Antarctic ice sheet, several meters worth of sea level rise, to go in a decade. We used to think it was centuries.” — Andrea Dutton Geochemist at the University of Florida. Recent reports out from Climate Central and supported by the work of experts show that a sea level rise of at least 6 meters could already be locked in. And as bad as that sounds, a six meter sea level rise from the warming already set in motion by high atmospheric greenhouse gas levels and likely to come from further human emissions could be a best-case or even unrealistic scenario. To get an understanding as to why so much water may be heading toward the coastal cities of the world, enough water in a 6 meter rise to set off a mass migration of hundreds of millions away from the world’s coasts (just 1.1 meters is enough to flood out 150 million people), it helps to take a good, hard look at paleoclimate. In studying past, warmer, climate states, we can get an idea how much additional sea level rise might be in store. When looking at these past climates for comparison, the key readings to keep in mind are — temperature, greenhouse gas level, and related sea level. Starting with the current climate that is now being rapidly warmed by human fossil fuel burning, we find that this year peak monthly CO2 levels hit near 404 parts per million. It’s a value fast approaching the top of this key greenhouse gas’s range during the Pliocene around 3.5 million years ago. A time when temperatures were 2-3 degrees Celsius hotter and sea levels were between 25 and 75 feet higher than they are today. Looking at the climate situation in this way tends to elicit a bit of an ‘oh crap’ response. And it should. For all other things being equal, if CO2 levels were to remain so high over the course of a few Centuries, that’s where we’re headed. Toward a world with 2-3 C hotter temperature and 25 to 75 foot higher seas. But the atmosphere of today is only a rough allegory to that of Pliocene times. In addition to CO2, our airs now host expanding volumes of other greenhouse gasses — exotic and common. A vast majority of which are emitted as a result of fossil fuel burning, extraction, and industrial processes. So to compare our atmosphere to that of the period around 3.5 million years ago and expect the same results with regards to temperature and sea level would be unrealistic. Current methane readings alone — in excess of 1800 parts per billion — now hit levels likely twice that of the Pliocene. And methane is a greenhouse gas with a global warming potential equal to 20 to 120 times that of CO2 over timescales relevant to current human civilization. As a result of this additional accumulation of methane and other gasses, this year’s atmosphere is a closer allegory to past atmospheres containing an equivalent of about 484 parts per million CO2 (CO2e). Such times, occurring 15-25 million years ago, hosted sea levels that were more than 100 feet (and possibly as much as 200 feet) higher than today. It is for this reason that we should view Climate Central’s recent and excellent report on sea level rise — based on Paleoclimate and predicting that at least 20 feet of sea level rise could already be locked in — with a bit of concern. At issue with the report are two factors. The first is that the study bases its findings on predicted temperature increases for the 21st Century only. A process established by IPCC-based studies in which it is assumed that 2 degrees Celsius warming over the course of this Century is, perhaps, the best possible target we can hit through a pretty rapid transition to a zero or near-zero carbon civilization. Implied in this IPCC approach is limiting global CO2 accumulation to 450 parts per million or less. A level that also implies a 530 to 550 parts per million CO2e when other gasses are added in unless all the methane overburden falls out due to its short atmospheric lifetime (about 8 years). A dicey assumption at best considering that at least some and possibly all of that overburden could be maintained by feedbacks now at play in the Arctic and in the world’s land and ocean systems. In worse cases, we could see the methane overburden expand in the event that the Arctic carbon stores are less stable than we’d hoped. So while 450 parts per million CO2 might limit us to between 2 and 2.3 C warming this Century, 530 to 550 parts per million CO2e gets us to 2.2 to 2.9 C.
The second issue is that we are only looking at warming for the 21st Century. Due to the long term warming impact of CO2 and other greenhouse gasses on the climate system in total, each 1 C worth of warming this Century implies about 2 C worth of warming long term (ESS sensitivity). So hitting the 2 C target by 2100 gets you to 4 C after many Centuries. And hitting a 550 parts per million CO2e threshold means about 2.7 to 2.9 C 21st Century warming and 5.5 to 5.8 C long term warming. An upper range that is nearly enough to melt all the land ice on Earth and raise sea levels by nearly 240 feet. 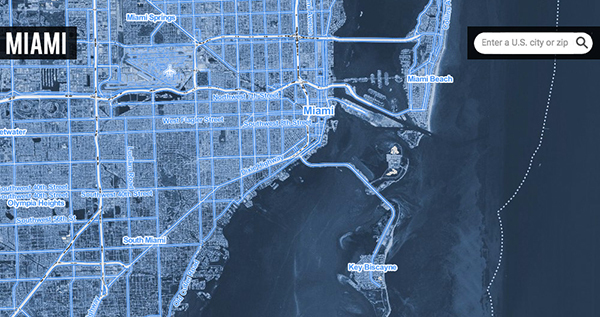 How Fast Could Sea Levels Rise? At least 6 meters indeed! In the 550 parts per million CO2e case, we have one of the better global human carbon emissions scenarios meeting with one of the somewhat more pessimistic Earth Systems response scenarios (but not the worst case) for an absolutely terribly catastrophic outcome. An outcome made even more terrifying by the fact that it is in the mid-to-low range of overall projected greenhouse gas forcings for this Century. In other words, 2 C warming this Century can start to look like a pretty bad outcome for the long haul and we’d probably best be trying to hit well below the implied 450 ppm CO2 target (as Hansen and others have warned). And to this point, we had better move very fast on emissions reductions, because the longer even current greenhouse gas levels are maintained the more likely we hit ice sheet destabilizations that push world ocean levels closer and closer to the Pliocene’s or Miocene’s swollen seas. Which brings us to a final question hinted at in the header — how fast could sea levels rise if human forced warming approaches 2 C or more this Century? The modelling efforts Dutton hinted at shows that West Antarctica alone can contribute meters of sea level rise over the course of just decades. And going back to paleoclimate studies of the end of the last ice age we find hints that somewhere between 1 and 2 C worth of warming can trigger very large and rapid glacial outbursts (that then increased sea levels by as much as 16 feet per Century). 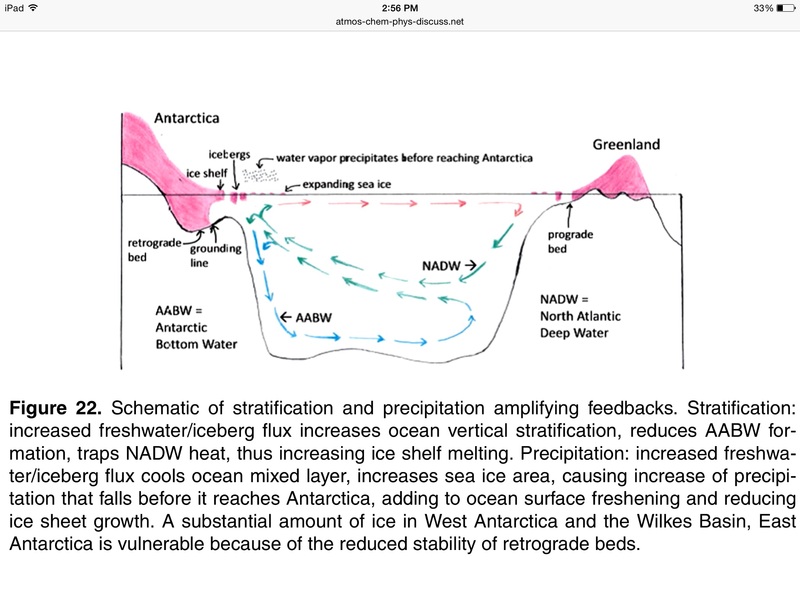 Finally, recent glacier surveys from Antarctica to Greenland have found extensive and expanding destabilization. 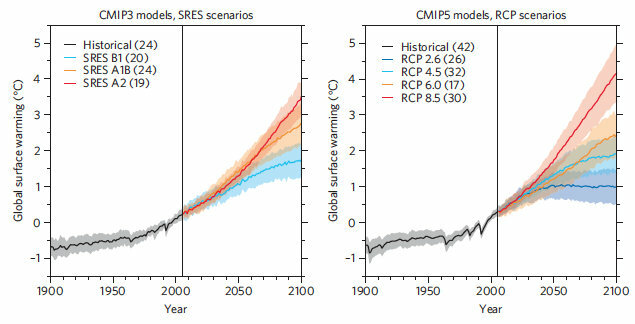 Efforts and evidence that imply the 39 inches of sea level rise predicted by IPCC this Century may be quite conservative, even under the better case emissions scenarios. Last year’s warnings from this blog of a possible extreme heat eruption in the Equatorial Pacific, unfortunately, appear to be bearing out. In other words, It’s really starting to look like a monster out there. Repeatedly over the past year and a half, noses of warm water have emerged from the heat overburdened Pacific. Massive, godzilla-like things delivering extraordinary warmth to thousands of miles of Equatorial Pacific surface waters. An epic ocean heat reflux that is now boosting human carbon emissions’ push to crack new record global high temperatures for 2014 and 2015. One that is resulting in far-flung extreme weather events around the globe and is, even now, injecting an obscene amount of record heat into the Arctic, setting off unprecedented wildfires and blasting plumes of permafrost burn smoke up and over the North Pole. 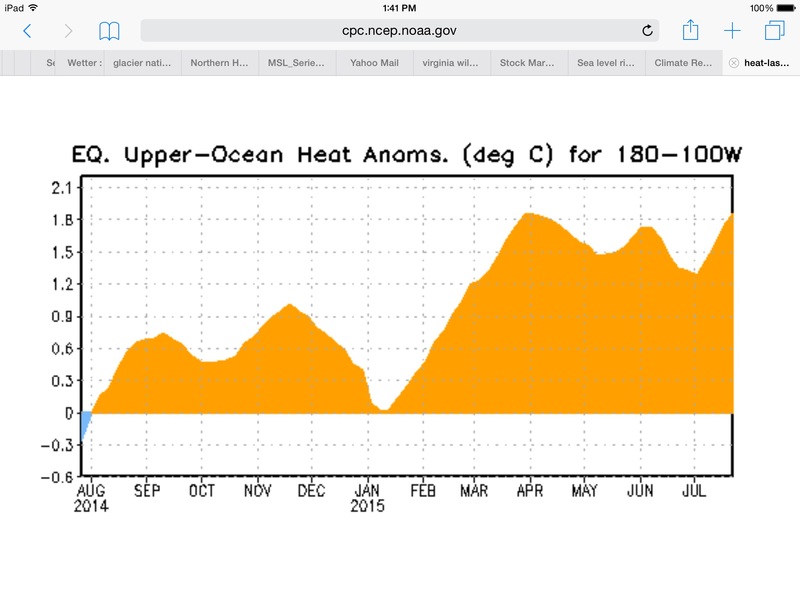 It’s a long succession of waves of Pacific warming that has continued in train since late winter of 2014. A trend of relentless ocean heating that has now driven Nino 3.4 values into the strong event range. A level of intense heat that models say will only grow stronger as the days, weeks and months progress on through Summer and into Fall. According to NOAA’s most recent El Nino Report, Nino 3.4 values hit the strong El Nino threshold for the second week of July, 2015. Rising to +1.5 C above decadal averages, this region of the Central Pacific warmed into a hot zone reserved only for the most intense of El Ninos. A level that must be maintained for three months for a strong event to be declared. But as of last week, we’d crossed into that ominous territory. This crossing of the strong El Nino threshold occurred even as extreme hot water anomalies extended up from the Equator, along the US West Coast and up into the Arctic Ocean itself. A set of anomalies that helped push PDO values into an also strong range of +1.5 for June, a re-intensification that ocean surface temperature signatures indicate is likely to further heighten through July. Though Nino 3.4 just tipped into the strong event threshold this week, heating along the Equator was most intense in regions closer to South America. Nino 1+2, just off the coast saw values hit a +3.3 C positive anomaly. And Nino 3 ranged into +2.1 C territory. Though not yet near the 1998 peak monthly thresholds (just above 4 C for Nino 1+2 and near 3.5 C for Nino 3), these values are rapidly closing the gap. Nudged by a still ongoing Westerly Wind Burst (WWB), it appears another warm Kelvin Wave is starting to gather steam. This after a ‘cool’ wave was crushed by powerful cyclone development in the Western and Central Pacific during the past two weeks. Wind anomaly potentials in this region have been quite strong and widespread — rivaling the intensity of the record WWB of March of 2015 and showing an even broader zonal coverage. Last week, forecast models began to pick up the signal of this new and implied potential third warm Kelvin Wave development. Now, these same models show a heightened risk for record El Nino development with El Nino, in many cases, predicted to remain in the monstrous to record monstrous range from now until the winter of 2015-2016. PDF corrected model runs indicate an event that peaks out in the range of 2 C positive seasonal anomaly in the Nino 3.4 zone (just shy of the record 1998 event). Uncorrected ensemble runs including the ECMWF model show a much more extreme El Nino peaking out at 2.9 C positive anomaly in the seasonal average. An event of this kind would truly be a monster to settle all the record books. It’s an event we really, really don’t want to see. One that would likely push the already extraordinary +0.75 C above 20th Century temperatures we have for 2015 so far even higher. But it’s one that global forecast tools keep predicting with increasing certainty. It’s in the models constantly now. An endless litany week after week — deep ocean warming is coming back to haunt us.